The Turkish flag flies over the the Turkish Ambassador's residence in Washington. The Turkish authorities said they are suspending all non-immigrant visa services provided by the Turkish mission facilities based in Washington as a countermeasure to a similar decision by the US announced just hours before. 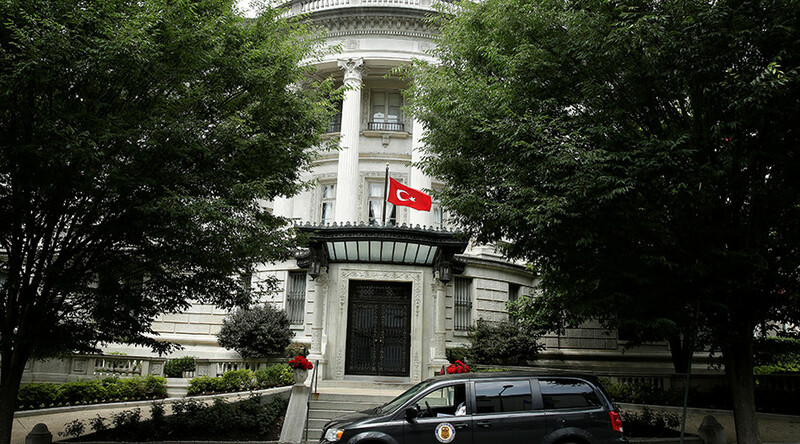 "Recent events have forced the Turkish government to reassess the commitment of the government of the United States to the security of Turkish mission facilities and personnel," Turkey’s Washington embassy said in a statement Sunday. The statement effectively mirrors the one by issued by Washington less than 24 hours previously. The US restricted its visa services in Turkey in response to the arrest of an employee of the US General Consulate in Istanbul, Metin Topuz, a Turkish citizen, earlier in the week. Topuz was reportedly accused of being an accomplice of the exiled Turkish cleric, Fethullah Gulen, who is blamed by the government in Ankara for orchestrating a failed coup attempt last July. The US embassy strongly condemned the arrest of Topuz, who remains in custody, calling the claims of his involvement in the coup “baseless, anonymous allegations” that could “undermine and devalue the longstanding partnership” between US and Turkey. US-Turkish relations have been on the rocks since Washington’s refusal to extradite the US-based Gulen to Turkey and the support the US military openly provides to the Kurdish YPG [People's Protection Units] militia battling against ISIS in Iraq. Ankara views YPG as an extension of the outlawed PKK [Kurdistan Workers' Party], which has been embroiled in a decades-long military confrontation with the Turkish government in the southeast of the country. Neither Washington nor Ankara specified how long the “reassessment” of bilateral security commitments, announced this weekend, is expected to take.